Frittatas and omelets are great for breakfast (or dinner for that matter), but not exactly easy to take with you when you're running out the door. Max and I have a fun solution: Mini Egg Muffins, 3 Ways! 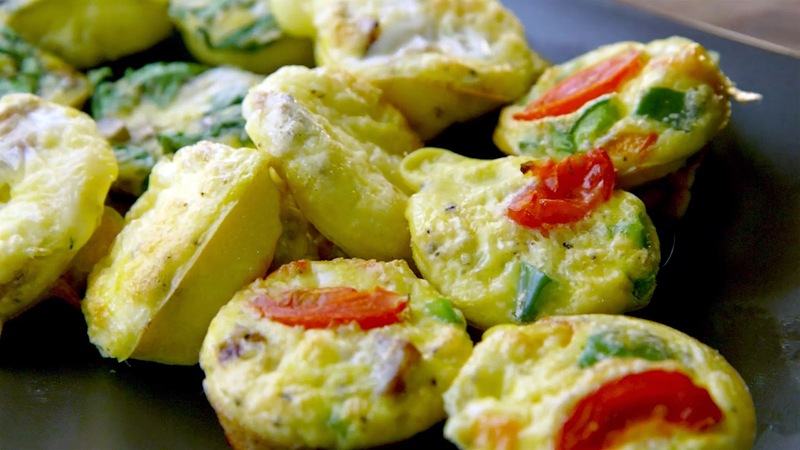 Breakfast is as easy as grab-and-go with these mini egg muffins. Just mix it all together and pop it into the oven while you finish getting yourself ready or make them the night before and just give a quick reheat in the morning. Plus, isn't everything kind of more fun when it's in miniature? Grease your mini muffin tin with some butter. Evenly distribute the diced sausage and bell peppers between each mini muffin. In a large bowl whisk the eggs. Season with salt and black pepper. Pour in the egg mixture, filling each mini muffin cup about 3/4 of the way full. Gently top with a cherry tomato half. Eat right out of the oven or allow to cool and wrap and refrigerate to enjoy later. To heat just pop them into the microwave or into the toaster oven until heated through. Instead of Sausage and Peppers, try these flavor combinations. Use the same amount of eggs and follow the same steps, just replace the muffin ingredients. This was a TERRIFIC concept. I call mine "garbage gems" as I used leftovers. 1. Did a variation on eggs Benedict - used leftover Canadian bacon and Swiss then topped with left over Hollandaise sauce. All of these things were leftover in the fridge and would have likely been thrown out for not being used. So you took what would have ended in the garbage and made a gem of a breakfast - thank you and happy new year!